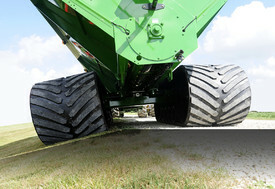 Equalizer Track Undercarriage Wins AE 50 Award - Unverferth Mfg. St. Joseph, MI - The American Society of Agricultural and Biological Engineers (ASABE) announces that Unverferth Manufacturing Company, Inc., has won a prestigious AE50 award for its innovative Equalizer tracked undercarriage for grain carts. AE50 competition entries are submitted annually by companies around the world with up to 50 of the best products chosen by a panel of international engineering experts. The judges select products that will best advance engineering for the food and agriculture industries. The AE50 awards program is sponsored by Resource magazine to emphasize the role of new products and systems in bringing advanced technology to the marketplace. These engineering developments help farmers, food processors and equipment manufacturers cut costs, enhance quality and increase profits. Increasing flotation and minimizing soil compaction is at the top of many farmers minds during harvest to maximize next year’s crop yield. The Equalizer track undercarriage for grain carts provides added flotation and is designed to keep the cart’s footprint evenly distributed across varying terrain. The undercarriage features a patent-pending pivot point that allows each track to not only oscillate up and down, but also left to right for equalizing the cart’s footprint over uneven terrain. The undercarriage features the industry’s first 42”-wide belt with shallow tread design provides 15% greater footprint, over 60 square feet, yet retains a 12’8” length for easier turning around corners and minimizing berming. Hydraulic belt tensioning provides easier track alignment, optimum ground contact and even weight distribution. Two sets of four pivoting bogie wheels rotate up and over ground contours for even greater ground contact. Each tracked undercarriage is standard with an automatic greaser for consistent lubrication of the track’s pivoting points. The Equalizer track undercarriage is available on select 1,300 bushel and larger models of the company’s four grain handling brands; Brent, Killbros, Parker and Unverferth. Unverferth Mfg. Co., Inc. is a family owned manufacturer and marketer of tillage, seed, hay- and grain-handling equipment along with pull-type sprayers and agricultural dual, triples and specialty wheel products. For additional information, contact Unverferth Manufacturing Co., Inc., P.O. Box 357, Kalida, OH 45853. Phone 1-800-322-6301, 419-532-3121 or visit the website at www.unverferth.com.